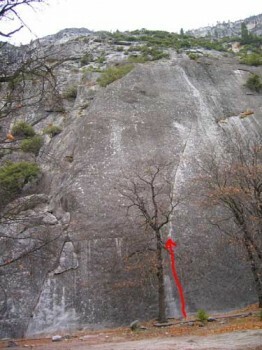 This awesome pin-scarred route is perfect training for Serenity Crack. French free 20 feet to the 5.8 crack. Use long slings at the start of Pitch 2. The crux is 5.10a fingers. Two rappels with a 60m rope will get you to the ground. Which SuperTopo guidebooks include a topo for Aid Route? Swan Slab offers the highest concentration of short, moderate routes in Yosemite. Looking up at the route from the base.